Recently renovated, the fun and funky Roxy Theater is Missoula’s Community Cinema. Recently renovated, the fun and funky Roxy Theater is Missoula’s Community Cinema. 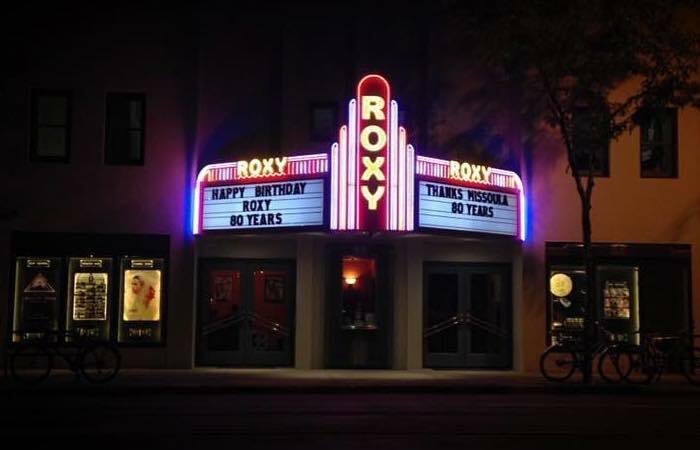 A non-profit arthouse venue, the Roxy hosts regular weekly screenings of award-winning new and classic films from around the world, and celebrated live events. Wednesday & Thursday nights are devoted to special one-off screenings, community programs, and oddball events. In addition, The Roxy hosts exclusive cultural programming, including The Met: Live in HD and National Theater Live, presented by Morris Productions. In addition to an ever-changing line up of exciting programs, The Roxy is also the host venue for many annual events, including our own much celebrated International Wildlife Film Festival, the oldest and longest running wildlife media event in the world. The Roxy has three screens all with HD projection and 7.1 Dolby® Surround Sound. The largest room has 150 seats, the second screen has 120 seats and a 25x10' stage; the third stage, The Empress, named after Bessie Smith, “The Empress of The Blues”, who died the same day the Roxy opened, September 26, 1937, seats 75 and is also equipped with a 25x10' stage.